Bishop R. Daniel Conlon was born in Cincinnati on Dec. 4, 1948. His parents, both still living, are Robert and Carla (Holzman) Conlon. He is the oldest of six children. He grew up as a member of St. Mary Parish, Hyde Park, Cincinnati. On March 9, 1974, he was ordained a deacon at the Cathedral of St. Peter in Chains, Cincinnati. He completed a Master of Divinity degree in 1975 at the Athenaeum of Ohio/Mt. St. Mary Seminary of the West in Cincinnati. After serving as a deacon at St. Agnes Church, Cincinnati, he was ordained a priest on Jan. 15, 1977, at that church. He served as associate pastor at Immaculate Heart of Mary Parish, Anderson Township, Cincinnati, from February, 1977 until July, 1982. Beginning in August, 1981 until August, 1983 he served as director of the Office of Planning and Research and assistant chancellor in the Archdiocese of Cincinnati. For the next three and a half years, he studied canon law at St. Paul University in Ottawa, Ontario, earning the degrees of Doctor of Canon Law and Doctor of Philosophy in January, 1987. He returned to Cincinnati to become the archdiocese’s chancellor and director of its Department of Executive Services, serving in those capacities until July of 1996, when he was named pastor of Holy Redeemer Parish, New Bremen, Ohio. He served there until he was installed as the bishop in the Diocese of Steubenville on Aug. 6, 2002. Bishop Conlon has served on many committees and boards within the Archdiocese of Cincinnati, including The Catholic Telegraph Board, Board of Mediation, Catholic Committee on Scouting, Futures Committee, Archdiocesan Pastoral Council and Presbyteral Council. He has been active in leadership roles in the St. Mary Deanery. He has also served as an officer and committee member in the Canon Law Society of America. He is a graduate and member of Leadership Cincinnati, a former member of the Cincinnatus Association and a member of the Dan Beard Council President’s Council. On July 14, 2011, Bishop Conlon was installed as the bishop in the Diocese of Joliet, replacing Bishop Peter Sartain, who had been installed as the Archbishop in the Archdiocese of Seattle in December 2010. As a member of the United States Conference of Catholic Bishops, Bishop Conlon has served on the Administrative Committee, the Subcommittee on Marriage and Family and the Committee on the Protection of Children and Young People, of which he currently is chairman-elect. The December issue of Christ is our Hope opened with Bishop Conlon’s message about the importance of Catholic education. •In October, Bishop Conlon addressed 800+ Catholic principals and educators at the Annual Catechetical Institute, hosted at Lewis University. 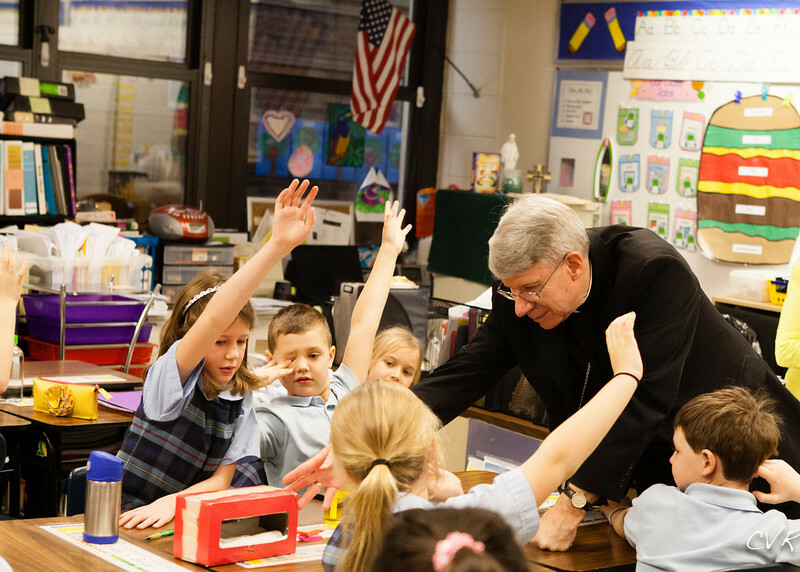 Bishop called on our leadership and teachers to fulfill the mission of Christ within our Catholic schools.